No doubt many former pupils, teachers and staff of St Elphin's School are wondering what has happened to the school and whether, in fact, it is still in existance – particularly those who may not even be living in the UK anymore. 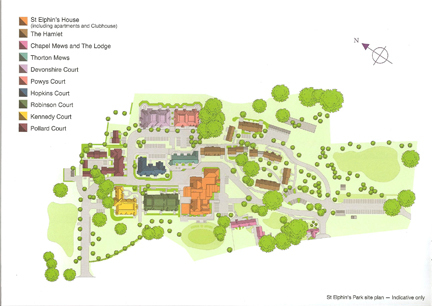 Once a Victorian spa before becoming St Elphin's School, the main school building (St Elphin's House), chapel, Orchards dormitory block and grounds have been sensitively restored into a luxury retirement village by Audley Court Ltd. Although work was delayed for a couple of years due to the economic climate, work finally recommenced in January 2011. 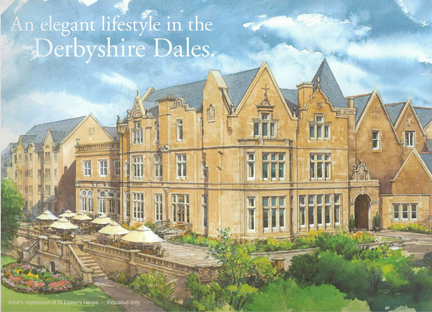 The original main school building (now known as St Elphin's House) has been sandblasted and very tastefully restored and now houses several luxury apartments, The Audley Club (swimming pool and health centre), The Orangery Restaurant, The Bistro, residents library and two guest suites. In the grounds are various apartment blocks and meews which have all been given names in memory of St Elphin's School, as have some of the roadways. These are Crompton Close, Chapel Mews, The Lodge, Thornton Mews, Devonshire Court, Hopkins Court, Robinson Court, Kennedy Court and Pollard Way. 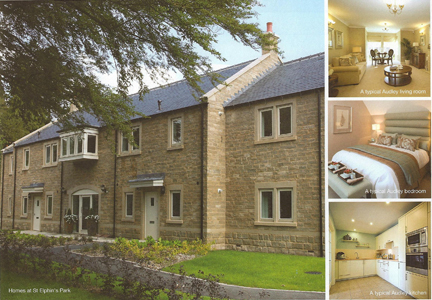 If you enjoyed your time at St Elphin's School and would like to be a part of history in the beautiful Derbyshire Dales, why not consider retiring to St Elphin's Park? For further information click on the link below. The above information, photographs and images are all © Audley Court Ltd and have been reproduced on this website by kind permission. 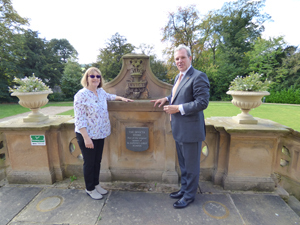 The completion of st St Elphin's Park took place on 28th September, 2017 with a ribbon cutting ceremony by Nick Sanderson, CEO of Audley Ltd. and Susan McLean, General Manager of St Elphin's Park. I was honoured to be invited to the ceremony and was, in fact, the only old girl or member of staff who was present. I spent a lot of time talking to residents who were fascinated to hear about my time at St Elphin's as a pupil. I had a good chat with Nick and he is delighted that links with St Elphin's School are continuing and is very keen for them to continue. 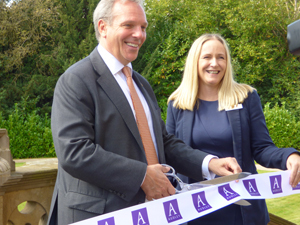 It was also very fitting that the cutting of the ribbon took place in front of "our" Invicta stone. The main building of St Elphin's School was sandblasted in 2011/12 and has now been converted into a Residential and Leisure Centre. 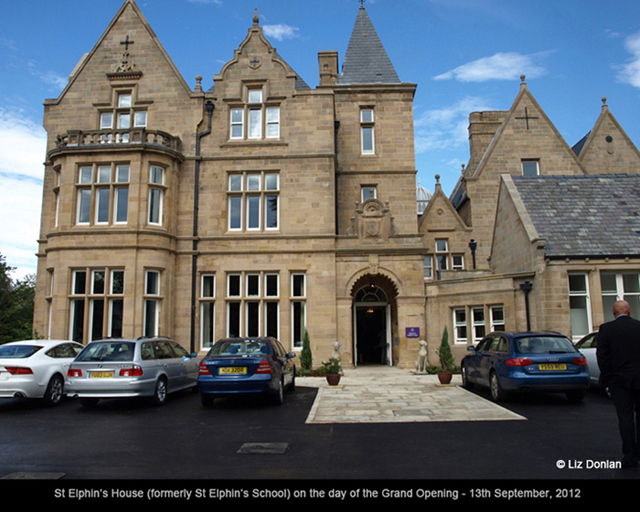 The building was opened as St Elphin's House on 13th September, 2012 by Lord Edward Manners, owner of Haddon Hall. It is good news for Old Elphinians in that the main school building has been retained – and returned to its original colour! – and it has retained the name of St Elphin's. I was fortunate to be invited to the Grand Opening of St Elphin's House and, in fact, there were only two pupils present along with three members of the teaching staff - Miss J. Crook (Deputy Head Mistress, 1978 - 1999), Mrs R Cuff (Infants Teacher, 1986 - 2004 and Deputy Head Mistress, 2005) and Miss P J Simpson (Biology Teacher, 1986 - 1988). There were approximately 180 people present at the opening consisting of residents, Audley staff, guests and, of course, old girls. St Elphin's House was opened by Lord Edward Manners, owner of Haddon Hall. Ground Floor: Orangery Restaurant, Bistro, Drawing Room, Library and Audley Club Leisure Centre (swimming pool, gym, meetings room, hair salon, treatment rooms, health & wellbeing centre), one 2-bedroom apartment. Non-residents of St Elphin's Park are able to apply for membership of the Audley Club Leisure Centre. Please click on the photo below to view the complete album of St Elphin's Park - all photos © Liz & Mike Donlan. I have annotated the photographs as accurately as possible and have indicated what the original use of some of the rooms was. However, the use of the rooms changed over the years and it would be difficult to state every single use so everything is relating to the 1960s and 1970s! I was honoured to be invited to the Topping Out Ceremony for Robinson Court, along with Judy Crook (former Deputy Head Mistress 1979-1999) and Rosemary Cuff (former Acting Head Mistress at the closure of the school). Robinson Court is a new build which will consist of 20 luxury one and two bedroom apartments and is named after Miss Robinson, Head Mistress 1958 - 1975.